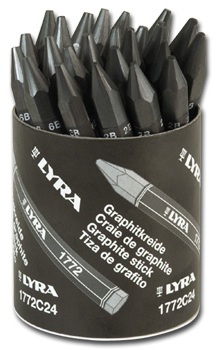 Contains 8 pieces each of 2B, 6B and 9B Lyra Graphite Crayons. This graphite crayon is approximately 1/2" in diameter and 4-1/2" long. Excellent for sketching, layout and design. Its silky smooth surface glides over most papers. A paper covering keeps hands clean in the process.